Outwardly I wasn't concerned about my first time on a P&O Cruise ship but inwardly I guess my subconscious anxiety was working overtime. I'll spare you the details but just know my digestive system was pretty empty by the time my partner, Kathy, and I left the house. That said, once we were on the boat for our three day cruise from Adelaide, South Australia, with a stop at Kangaroo Island (KI), and back to Adelaide again, everything went pretty well, with nothing to be too concerned about. The ship didn't leave until four in the afternoon. However we were able to board in time to not only have lunch on the boat but also spend a couple of hours exploring. Our ship was called the Pacific Eden and is pretty much what you might imagine a cruise ship to be from the outside. Maybe bigger or smaller than you think depending upon whether you've seen a cruise ship before. This particular ship will be retired from March 2019, having been sold to another cruise ship company. On the inside it kind of has the vibe of living in a hotel attached to a multi-storey shopping mall/entertainment complex. Everything you'll ever need is within walking distance of your room; shops, bars, restaurants, health and wellbeing centres, theatres, swimming pools, and more. Of course you have all the benefits of being on a cruise ship; spectacular ocean views, plenty of decks and deckchairs to enjoy them from. You can even have your own Titanic moment leaning over the front of the ship if that's something you really want to do. 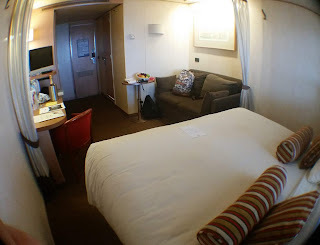 Our room was located on deck six, at the very back of the boat, which is supposed to be the better end to be in if you're concerned about motion sickness. Inside it was about the size of a standard, small motel room, with a king size bed, couch, desk, TV/DVD player, and a good size ensuite. 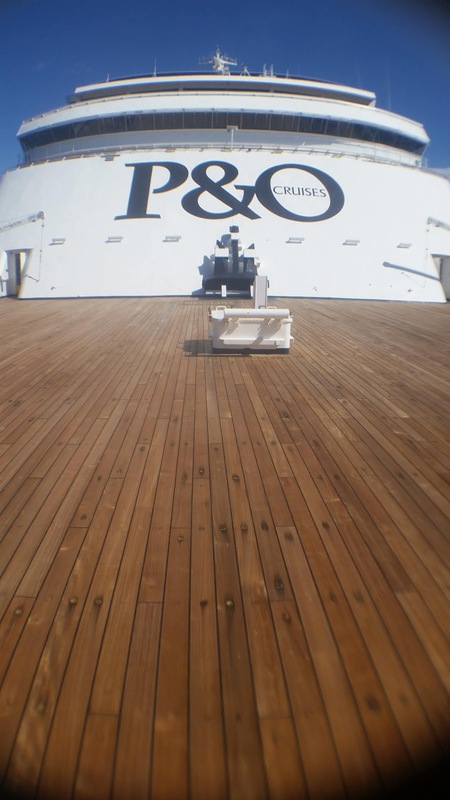 Our deck was surrounded by the 'walkaround' exterior deck that is conveniently the same area we needed to assemble for the lifeboats in an emergency. Despite being someone who can start feeling queasy staring down at my phone in the passenger seat of a moving car, prior to the trip, I wasn't concerned at all about motion sickness. I figured you probably wouldn't feel too much motion on such a large boat. I was completely wrong there. One point to my subconscious anxiety. Fortunately it was manageable, and certainly not as bad as you're imagining right now. Sickness is probably the wrong word too. It was more of a dizzy sensation when I was noticeably feeling it. First day my motion sickness was a little unsettling, especially during our evening meal. Kathy and I both found it helpful looking out the windows toward the horizon. For me at least, it seemed to help my brain reconcile the motion with the movement of the boat. At any rate all my food stayed down (probably thanks to my very empty digestive system). I did take a couple of ginger motion sickness tablets on the morning of the second day, more as a precaution than any feeling of needing them. By the third day, when we had the roughest seas (1-2m swell), while it was still noticeable, it wasn't really making me feel queasy. Though it is interesting walking around on a cruise ship while there is a 1-2m swell. 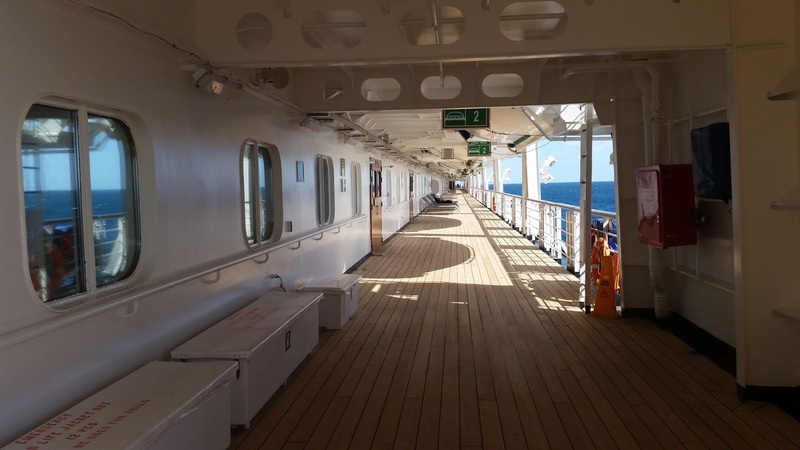 Generally, when motion sickness was starting to get the better of me, a walk around on any of the open air decks was helpful. Strangely these areas seemed more stable than anywhere confined by walls. Based on my one experience of cruise ship life your holiday can be one of two extremes, or a mix of them depending on what activities you like. On the one hand, if you just want to kick back in a deckchair and enjoy a peaceful, relaxing trip, with fine dining and quiet drinks with friends, you can certainly do all that. On the other hand if you want to be kept on the go with all kinds of activities, entertainment, and parties, that's available for you too. rear deck staring out to sea. 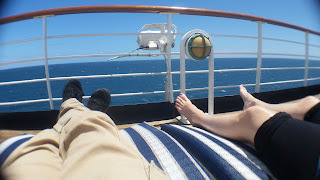 Kathy and I were definitely leaning more toward the kicking back and relaxing given it was only a three day cruise. 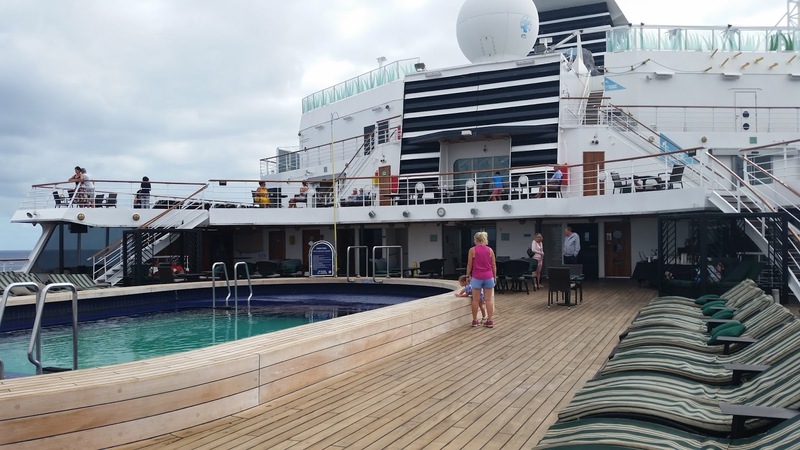 We enjoyed exploring the boat, trying out the food (though we only ate in two of the ship's many restaurants), and relaxing on deck chairs by the pools. We both attended an 'Increase your Metabolism' presentation (which was a sales pitch for one of the many health programmes available on board). Kathy attended another health presentation and did a session in the gym whilst I kicked back and did some sketching, and also started writing this article. Note that if you're into things like massage, acupuncture, seaweed wraps, health spas, hot rocks, health and/or beauty, then it seems there's a whole health and wellbeing industry running on most cruise ships selling fairly pricey programmes to help you detox your body and lose weight. The people running these programmes tend to do quite a hard sell on the benefits of their service. We randomly walked into their area of the ship on the first day and got a full tour of every service available. front of the boat. Photo - Kathy. 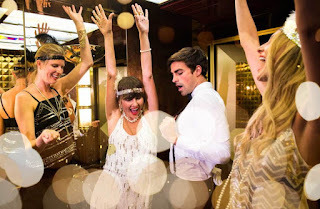 Personally, if you want to feel like you're having a luxury cruise experience, and you wouldn't miss two to three hundred dollars if you threw it into the sea, you might like give these things a try. 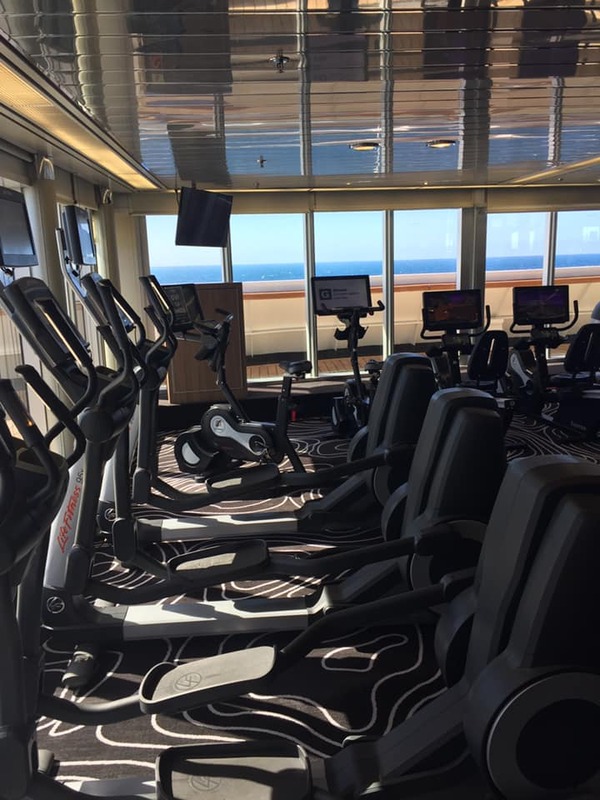 If you're budget minded, the ship's gym is free (and maybe don't over eat in the all you can eat restaurant). The final day we were supposed to make a stop at Kangaroo Island but unfortunately this didn't happen. There's no facility at KI for the ship itself to dock. To get to shore they employ tender boats to ferry people from the ship. Thanks to the 1-2m swell that I mentioned earlier it wasn't safe to transfer people from the ship to a smaller boat - which would really feel the waves. The sea never let up for the entire day so we got to sail past KI as the ship headed back out for another 'sea day'. Despite the swell, it was actually a nice, sunny day. The onboard activities were revised and a new programme was sent out before we even got down to breakfast. main themed party on our cruise. We continued to relax but if you're the more sociable or adventurous type, there were themed parties to attend, plenty of live music to enjoy, comedy shows, movies, trivia competitions, bingo, and you could even have an 'Edge' experience; activities that involved climbing around the edges of the boat, or having that 'Titanic' experience right up the front. Photo and description - P&O website. 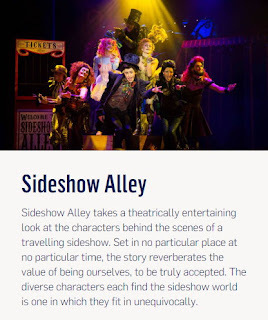 On our last evening we attended a live theatre show called Sideshow Alley. A special show created for the cruise that featured Tim Burtonesque like circus visuals and characters, singing covers of popular songs juxtaposed to create a kind of loose narrative. I really enjoyed it, particularly the set and costume design. Finally, if you're one of those people who need to stay connected to the internet, we had complimentary 250MB of data to use through the ship's wifi, which, whilst a little slow at times, was perfectly adequate. You do have the opportunity to upgrade your data to unlimited for an additional fee but, if you're just wanting to keep connected to your email and don't watch a lot of streaming video, 250MB is more than enough for three days. I didn't even use half of mine. Kathy came close to maxing hers out, but she was uploading images to and spending quite a bit of time on Facebook. The 18+ pool deck is a great place to hang out if you want time away from the kids on board. Top right of this picture is one of the 'Edge' experiences where you can climb around the outside of the boat. Overall, I enjoyed the three day cruise, despite not being able to visit KI (which would have been both of our first times there). Our primary goal on the boat was to relax and just enjoy being on a cruise ship. 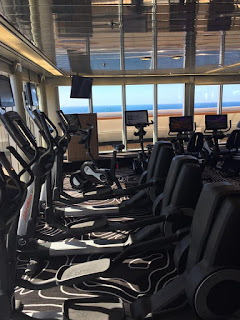 I feel on a longer cruise I would look into participating in more of the activities and entertainment options because you can do too much relaxing. At no time did the ship ever feel too overcrowded, with exception maybe to breakfast and lunch in the Pantry restaurant. Understandable though since that restaurant was basically the 'food court' of the ship and was on the main upper deck near both the ship's pools and outdoor areas. I would certainly recommend it as a way to relax and get away from your daily grind. If you're more interested in going for the parties, entertainment, and other activities, then this isn't the review that's going to tell you if they were any good. However there looked to be a good variety of things to do and the only way to ride a flying fox across the top of a cruise ship is to book a trip! Great review. Very informative. Thanks.